Mark's Musings on the Telecommunications Industry: Samsung A900: Toy or Tool? My old Sanyo 8100 from Sprint finally gave out. I could not charge the battery no matter how long I left it charging. Since my contract was up with Sprint, I had some leverage to purchase a new phone. I won't regale readers with the trials and tribulations I had with Sprint over this issue, but I am happy with the result. My choice was the Samsung MM-A900. I have heard it referred as a RAZR knock off, but it is so much better than the RAZR. This Bluetooth enabled device has many of the feature that will allow me to replace my PDA. My first phone choice would have been the Treo 700p, but I could not see paying $400 for it. The phone does about everything besides phone calls like playing games, music, streaming music and video, SMS messaging, and Internet access via EV-DO. The phone is Java-based so I can download third-party Java applications without paying Sprint, Samsung, or Qualcomm. The best thing about it is that I can send my contacts, appointments, music, pictures, and programs to it via Bluetooth. The transfer is simple and painless. I wish it had more than 50 MB of memory, but it has not been a limit so far. Samsung and Sprint loaded it with some useful applications, USB cable, charger, and stereo headset. The audio quality is very good, and streaming video looks well on the modest size screen. 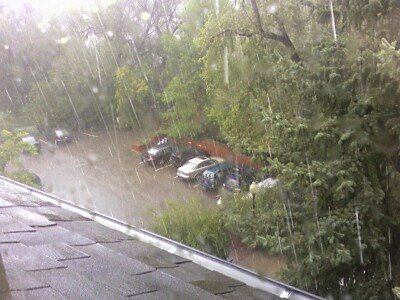 The picture above was taken with the 1.3 Mpixel camera during a sudden Boulder down pour. About the only thing I would change on it would be the ability to adjust the font size in text messages and turn off delete prompts (i.e. expert mode). Samsung hit a home run with this phone that I am sure that I will enjoy for many years. I just bought a A900, and i agree with you completely. But like you said, theres one thing that i dont like, and that is the font size is far too large when texting. I wish it was changeable. And i also would like a different font, but all those are small things, easy to get over. Is there no way to change the text though? Unfortunately there is no way to change the text. I too would like more control of the text sizes. I switched browsers to Opera Mini which gives me more text control over the default browser. I just swapped my wife's RAZR to the A900m because the RAZR kept failing. I like her phone because it allows for better control of the launch pad and favorites plus it has themes for the display. Unfortunately the phone does not come with a microSD slot to expand the available memory. That an even bigger limitation than the font size issue in my book. Complaints aside, it is still the best phone I have owned to date. I would think very seriously about the Blackjack should this phone meet with an "accident."